Stop back at the beginning of each month for our current newsletter! 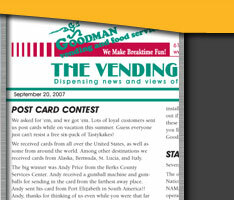 Goodman Vending and Food Service is proud of its monthly, award winning newsletter, The Vending Machine, which dispenses news to readers from throughout the vending industry. We invite you to take a little time to check out some back issues and interesting news articles, for which links are provided below. Information from these newsletters may be copied by other independent vending companies for use in their correspondence without giving credit to the source.